In the early 20th century, wild hogs overran Barren Island. As you’re walking south on Flatbush Ave., pause at the last stoplight before the Marine Parkway Bridge. Look to the right for a park path marked “Park Entrance.” Follow the path down to the water. You’ll be walking about 10 minutes, 15 if you’re slow like me—longer than you’d think. Don’t give up, there’s a payoff. At length, you’re at a fairly desolate beach, jammed full of bottles and other trash, as well as some washed-up boat wrecks. This is Dead Horse Bay, which used to mark the southern edge of Barren Island. There was once a small community here of well-kept small homes with porches, and the people who lived here ignored the stench of the animal rendering plants (the first one built in 1859) that once dotted the island, as thousands of deceased Dobbins were turned into a number of products including glue, fertilizer, and commercial gelatin in a process founded by Peter Cooper, for whom Manhattan’s Cooper Union school is named. In the 1920s, Barren Island was attached by landfill to Long Island in anticipation of Floyd Bennett Field’s construction. The horse rendering plants were closed and the homes razed, but the smell remained for several years. After the plants were closed the Dead Horse Bay shoreline became a landfill in the 1930s. 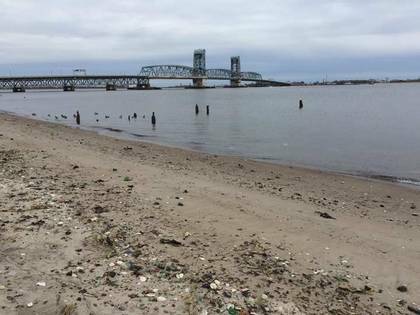 Thousands of tons of trash were buried under a narrow cap. 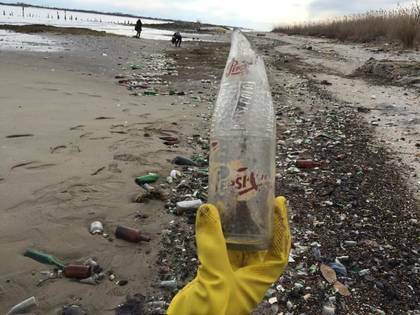 In the 1950s, this cap came apart and detritus of the decades, including thousands of bottles and plastic products that don’t biodegrade have filled the beach ever since. Equine bones can be found amid the garbage. I carted some home in my pockets after a recent trip there. In the very early 20th century, wild hogs overran Barren Island, consuming whatever garbage was laying around—and there was plenty, considering the rendering plants and the people who worked and lived nearby. Finally in 1909, the NYPD arrived, shotguns in hand, and embarked upon a hog massacre that eliminated hundreds of the swine. There’s one familiar sight here, the Marine Parkway (Gil Hodges) Bridge. It was constructed by the American Bridge Company for about $2 million and opened July 3, 1937 to facilitate traffic to Jacob Riis Park (which opened in 1932) and Fort Tilden, still an active military base. The Belt Parkway, offering a connection via Flatbush Ave., opened in 1940. At the time, Floyd Bennett Field was still a commercial airport, but after competition from North Beach (LaGuardia Field) and then Newark Airport, FBF was restricted to cargo flights, and now the field’s a museum and athletic center, as well as a training ground for bus drivers and the NYPD also has an anti-terrorism presence there. After Mets manager Gil Hodges’ death in 1972 at the age of 47, the bridge was sub-named for him. Hodges was also a longtime Brooklyn Dodger and though a native Indianan, he resided in his adopted borough with his family for many years. Although thousands of bottles from the ruptured landfill can be seen along what locals call “bottle beach” on the shores of Dead Horse Bay, of all shapes and many sizes, mainly clear, brown and green (beer bottles) white (mostly seen in cosmetic jars) and blue (used for medications, such as Milk of Magnesia or Vicks VapoRub) my favorites were the old soda pop bottles, especially when some of the labels were still attached. This one features the old ornate Pepsi-Cola logo used until the 1940s. 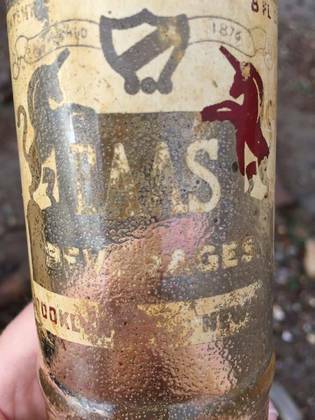 While off-brand soda such as Cott and Hoffman, which I remember from my youth, there were also little known and presumably short-lived brands represented in the landfill such as Baas and Tune-Up, which was apparently marketed as 7-Up formerly was, as an energy supplier or weight-check line. Before visiting Dead Horse Bay and its collection of detritus of the century, a quick look at the tide table for this general location is recommended. The next time I visited the tide was in and several parts of the beach were impassable.